Word has been received of the passing of Army Air Corps WWII veteran, Delta Pioneer and Delta Golden Wings member, retired NEA/DL pilot Captain Parker F. ‘Pinky’ Schofield. Born February 4, 1917 at Port Elizabeth, South Africa, Parker Fall Schofield was 95 years of age at the time of his passing March 14, 2012. 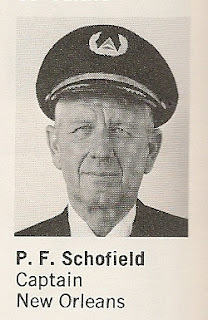 Captain Schofield hired on with Northeast 05-20-1941 and retired with Delta in 1977 at the mandatory age of 60. Parker Fall Schofield and Nancy Ann Ordway were married June 28, 1941 at the Unitarian Church, Cohasset, Norfolk County, MA. Captain Schofield’s wife Nancy passed away in 2005. Published in The Palm Beach Post from March 18 to March 25, 2012.